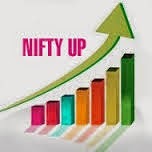 metal ,auto, bank ,infra sector again bullish trend in nifty, today nifty close above 6817 with gain of 38 point, infra share increase 2.25% as well as psu bank share also gained. Bank nifty gained 171 point at 12958 , axis bank, bank of India, sbi, pnb, yes bank top gainers in bank nifty. bharti airtel, bhel L&T, jp associate, top most gainers, while metal and auto share jsw, sesa stirlite, coal India, tata steel, ashok leyland, apollotyres, m&m top gainers. IT , Pharma, fmcg, reality share looked in under pressure , rupee also down more than 0.36 paise against dollar today close at 60.59.